We’ve just finished the first batch of brand spanking new miniguides to some of Shetland’s most popular crags. 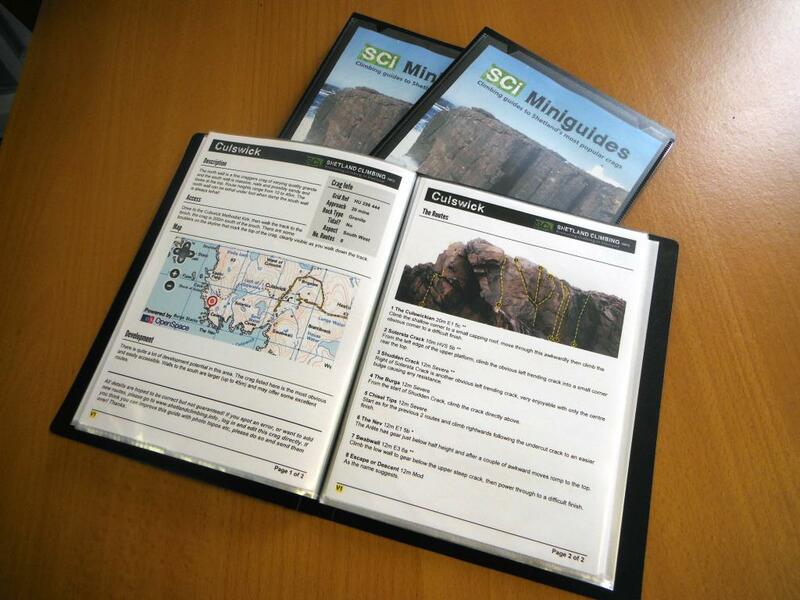 We made a few miniguides back in 2006 but they’ve long been out of date and we stopped printing them as it was too expensive. We’ve now decided to design a whole new layout based on the SCi Database which is now bulging with route and crag info! The guides cost a tenner for the set and for that you get a plastic booklet with the pages inserted into clear wallets. It works really well and means new versions for crags can be swapped in without having to re-print the whole thing. When you buy the guides we’ll sign you up to a mailing list and let you know as soon as a crag is updated, or we do a new guide to a crag. Updated versions will be free for you to print yourself, and new crags will cost a quid or so. We can print and post them for you for an extra quid. Most of the routes are shown on photo topos too, and we’ll improve this over time. You can also help out by making some photo topos for us, adding route information missing on crags and adding new crags. If we have the info, we’ll knock up a miniguide straight away. You can pre-order your guide now, and you should get them by the 13th May, or a bit earlier if you’re in Shetland and can pick it up. All profit from the guides goes to running costs for SCi and any left will go towards new bolts for the Verdans quarry. Fantastic, look forward to getting mine. Thanks Mark, hope you get some good use from it. Great to meet you the other day, Mark. Glad you like the guide!